Perhaps I should have written this long ago, but it just never seemed like a priority before now. Recent events have changed that, making it high time that I write this blog post. You need to read it if you are not clued up on the topic of Ripple – you really do. You especially need to read it if you have invested or possibly want to invest in Ripple – you need to know what you are putting your money into. I’m going to do my best not to make this an overt Ripple bashing post. There are enough crypto related articles on the internet that degenerate into emotional crypto slandering. I’m not interested in doing that (not this time anyway! ), I’ll try to keep this fact based. I don’t even want to tell you not to invest in Ripple, I just want you to know what you are investing in if you do. As always – it’s your decision. Digging into Ripple I did not like what I found. While I can’t share all of the findings of my research here (to be honest, I can’t even remember many of them! ), I will try to cover the salient points. Looking back thorough my records I had to laugh: The day I bought Ripple was also the day I bought rather a lot of COSS – which turned into a nightmare when the platform became a ghost-town, losing me a fortune in the process. It was also the day that I invested in Electroneum – which became the second worst ICO disaster I was involved in (after Envion), also losing me a lot of money. And it was also that day that I bought into Centra – which later suffered a major crash when the team leaders were arrested for fraud. That may just go down as my darkest day in crypto history! Since first digging into Ripple I have kept my ears open. I don’t like what I’ve heard since then, not one bit. I’ve also done a little further digging. Nothing good ever turns up, in fact, I would call Ripple the polar opposite of NEO. You see, every time I dig into NEO I learn something new. Every new thing I learn about it makes me even more a fan of the project. With Ripple it’s the other way round – the more I dig, the more I don’t like what I find. I wouldn’t call myself a Ripple expert, but I probably know a lot more than most, including many dedicated XRP investors. Sadly, like most cryptos, there are just so many people who buy it without doing their due diligence. Always DYOR properly people, always! 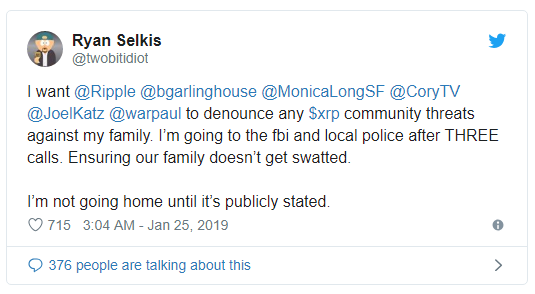 Last week I read a disturbing article in which some of the fanatical XRP supporters, known as the “XRPArmy” threatened a journalist named Ryan Selkis after he wrote an anti-Ripple piece. Of course this is not a reflection on Ripple itself, but it got my attention. Never one to take things at face value, I went to Ryan’s Twitter account to see things for myself. What I found was not pretty – countless XRP supporters vs Ryan in a “Is XRP good or bad” spiderweb of Tweet comments. 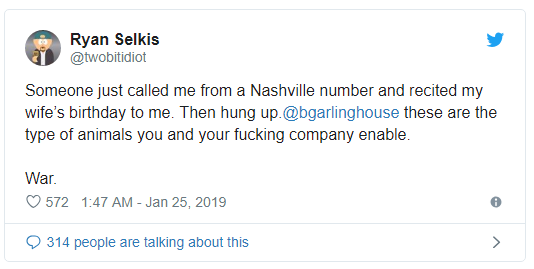 That’s still pretty normal, and death threats aside, probably less fanatical than the things I’ve seen on Electroneum forums! (There’s something wrong with ETN investors, seriously – those people can be weird!) What was concerning is how fanatical the XRP supporters were while simultaneously showing how ignorant they were about their beloved XRP. I’ve seen this sort of thing before, I’ve seen people resolutely adamant that their DasCoin or Karatbars investment is a great one and will change the world – right after they pay for their premium level membership fees that is! I am seeing way too many pro-Ripple articles now. The last week or two have been particularly bad. There seems to be growing positive sentiment towards Ripple as a cryptocurrency – and that is something which I can’t accept lying down – for reasons which will later become clearer. Those may not look like much, but they are. In part 2 of this post I will explain why those points are problematic. For now know that they are problematic enough to get me to finally write this post. Bit Brain you’ve lost your marbles. Everyone knows that Ripple is a cryptocurrency, saying that is isn’t is just stupid! Since a formal definition and list of crypto properties does not exist, here are mine. They are based on Satoshi’s vision and on the crypto market today. A cryptocurrency is a virtual construct of coins or tokens which exists on a distributed ledger called a blockchain (though some alternative ledger structures such as a “tangle” exist). The strength of cryptocurrencies lies in their ability to allow rapid, secure, cheap and anonymous transactions. They should work across borders without restrictions and beyond the reach of regulations and laws. Transactions can take place by means of smart contracts which ensure fairness by keeping the man out of the loop. The blockchain upon which they run should be as decentralised as possible to ensure security, durability and anonymity. Remember why cryptocurrencies came into being in the first place. Remember that Satoshi Nakamoto kicked Bitcoin off in the wake of a major global financial crisis caused by greedy banks loaning too much. Remember what Bitcoin was designed to fight and what it is meant to replace. Do you still think that Ripple is a cryptocurrency? I’m going to stop there for now because it’s a logical breakpoint. I still have a lot to say and I don’t want to rush it. Tomorrow I will pick this up where I have left off. Think about what I have said so far, and think about what you already know about Ripple. Tomorrow we dive into Ripple itself.